My grandmother always told me if you can't say something nice, don't say anything at all. Which is not helpful advice if you do a shopping blog. Nevertheless, it's hard for me to be overtly critical, even though sometimes products deserve it. Or at least, I think they do. 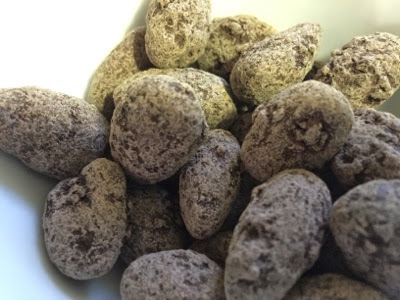 So, I'll admit my new least favorite product: the salted chocolate covered almonds. I really, really wanted to like these. The Kirkland dark chocolate almond cherry clusters disappeared from my Costco's shelves, the dark chocolate covered mangos disappeared, I needed a new dark chocolate replacement. This isn't it. The foretaste is pretty good, like the Kirkland dark chocolate covered almonds and cherries , but the aftertaste is too salty - much saltier than the Kirkland chocolate covered caramels. I'm going to try to develop a cookie recipe to use them up.